Why Can’t You Give Me A Stump Grinding Price Over the Phone? When a tree is removed down to the stump it is best to go another step further and remove the stump itself as well. Having a stump covered over could cause rotting to happen and harbour insects such as termites, ants and other pests that could lead to bigger problems in the future and could damage nearby vegetation along with it. Armac has been removing trees and grinding stumps since 1999 and with this experience can remove trees, roots and all leaving your premise cleared for your next project. Didn’t areas need to have different considerations this is why we can’t give you a stump grinding price over the phone. Nothing is what it seems on the surface, that is why Armac will work closely with nearby farmers and rural properties to minimise the chances of damaging important infrastructure. No tree is the same and either is the root system, so assessing first the shape and size of the stump will ensure the right equipment is used for the removal of your stump. Trees can grow in all shapes and sizes and sometimes homes can be built around the trees so when one is removed all areas need to be taken in consideration and if stumps are near pipework then these areas need to be isolated first. 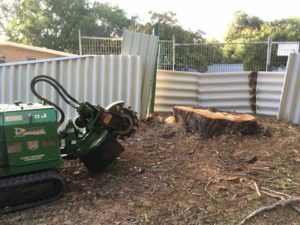 If stumps are to be accessed in the backyards, the best possible access areas will need to be organised for equipment to be able to get the stump removed. 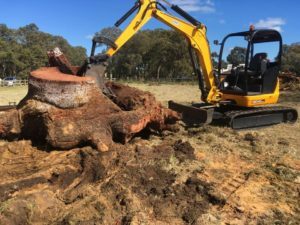 Certain trees have wider stumps, short or longer root systems and depending on the condition of the stump the removal will determine the process. If there is fencing nearby, pipework these are all factors to consider. Armac Stump Grinding and Tree removals and Yards clean up are your reliable professional operators in the industry. Contact Armac on 0448 442 477 for your free quote today.